Semaphorins are a large family of secreted and membrane-associated proteins necessary for wiring of the brain. Semaphorin 5A (SEMA5A) acts as a bifunctional guidance cue, exerting both attractive and inhibitory effects on developing axons. Previous studies have suggested that SEMA5Acould be a susceptibility gene for autism spectrum disorders (ASDs). We first identified a de novo translocation t(5;22)(p15.3;q11.21) in a patient with ASD and intellectual disability (ID). At the translocation breakpoint on chromosome 5, we observed a 861-kb deletion encompassing the end of the SEMA5A gene. We delineated the breakpoint by NGS and observed that no gene was disrupted on chromosome 22. 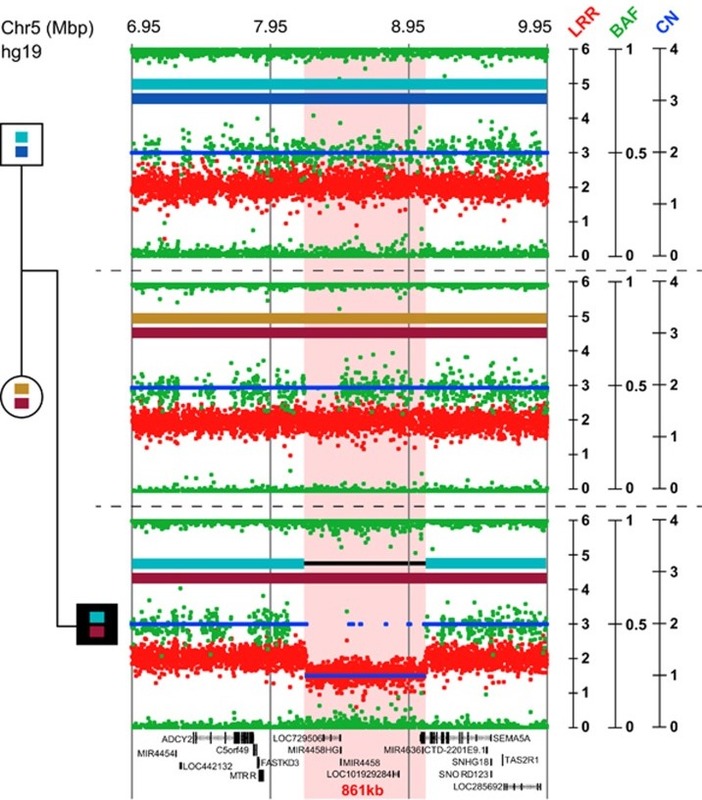 We then used Sanger sequencing to search for deleterious variants affecting SEMA5A in 142 patients with ASD. We also identified two independent heterozygous variants located in a conserved functional domain of the protein. Both variants were maternally inherited and predicted as deleterious. Our genetic screens identified the first case of a de novo SEMA5A microdeletion in a patient with ASD and ID. Although our study alone cannot formally associate SEMA5A with susceptibility to ASD, it provides additional evidence that Semaphorin dysfunction could lead to ASD and ID. Further studies on Semaphorins are warranted to better understand the role of this family of genes in susceptibility to neurodevelopmental disorders.